On Sunday, we enjoyed a wonderful brunch in unseasonably warm weather with our friends and neighbors. 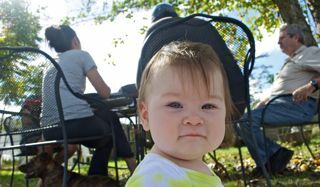 Babies on blankets and dogs in the grass rolled around in the dappled sunlight below our table. We roasted orange and white sweet potatoes to serve alongside a frittata of broccoli, kohlrabi, green onion and Parmesan cheese. 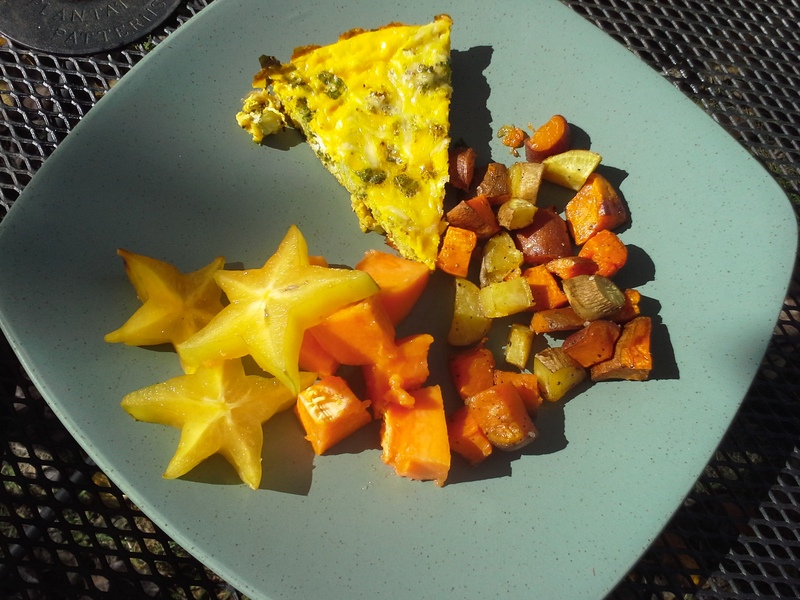 Locally grown starfruit from Possum Hollow and our farm’s own ripe papaya was the finishing touch to make it a special meal. Choose 1-3 vegetables you enjoy, chop into small pieces. Saute vegetables in a small amount of butter or oil in a cast iron skillet. Season with salt and pepper. Stir in a a few ounces of grated cheese or crumbled feta. Whisk together several eggs (anywhere from 6-12) plus a dash of milk. Pour the eggs over the veggies and cheese. Bake in the oven at 350 until the eggs are set in the middle of the pan. Let cool for 10-15 minutes and enjoy! This recipe is adaptable to the amounts of veggies and eggs you have available. Figure approximately 1 cup of raw vegetables for every 4 eggs. You want to cook things that have a lot of water (like kale or spinach) first so that they release their moisture before you add the eggs. Try combinations like: Tomato & Onion, Kale & Potato, Green Onion & Mushroom. Note: You can saute veggies in any pan and transfer to an oven proof 8 x 8 dish or small casserole dish for baking if you don’t have a cast iron pan.